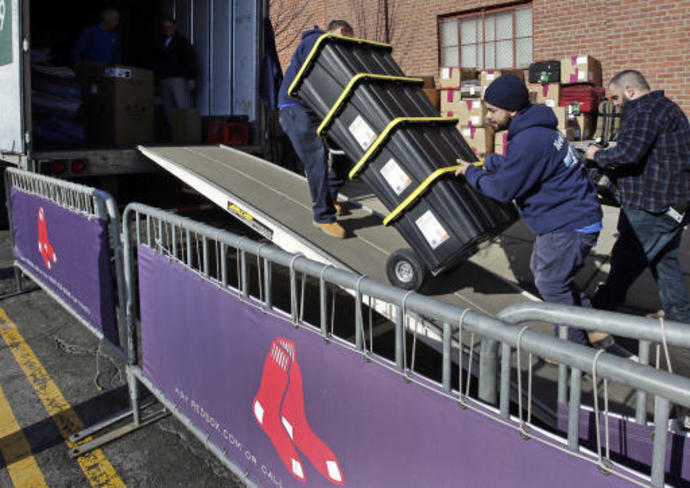 BOSTON (AP) -- The goal is the same for the Boston Red Sox in 2019: finish the season flopping around on the pitcher's mound, celebrating another World Series title. All that's left is for them to figure out who's at the bottom of the pile. The defending champions head to spring training without a closer after allowing Craig Kimbrel to test the free agent market. The right-hander who saved 48 games in the 2018 regular season and postseason declined a $17.9 million qualifying offer and is still unsigned, but the Boston brass says the budget won't allow them to spend big money on a closer, even one who is a seven-time All-Star. Joe Kelly, who emerged as one of the team's more reliable setup men during its run of three straight AL East titles, is also gone after signing with the Los Angeles Dodgers. Among the possibilities Dombrowski has mentioned for the ninth-inning role are Ryan Brasier, Matt Barnes and knuckleballer Steven Wright. Manager Alex Cora has also hinted that he might go without a traditional closer and play matchups. After four championships in 15 seasons, that's the closest thing to a crisis as the Red Sox attempt to win back-to-back World Series for the first time since 1915-16. OLD LOOK: For the second straight year, the Red Sox are essentially standing pat as they head to spring training. Don't look for a big splash like last year, when they added J.D. Martinez at the end of February. Trading deadline acquisitions - and World Series heroes - Nathan Eovaldi and Steve Pearce are back after signing new deals. ROOKIES TO WATCH: The organization's top prospect is third baseman Michael Chavis, who missed 80 games in the minors last year for violating the ban on performance-enhancing drugs. But Rafael Devers is solidly entrenched at third for the big-league club, and Chavis could remain in Triple-A another season to work on his fielding and striking out less. THEY'RE SET: The Red Sox will roll out essentially the same lineup as last year - and why tinker with a team that won a franchise-record 108 games in the regular season and then 11 more in October. One change: Starters Chris Sale and David Price won't be answering questions about whether they can deliver in the postseason. THEY'RE NOT: Second base is the team's biggest issue, with Dustin Pedroia trying to come back from a knee injury that limited him to just three games in 2018. Eduardo Nunez and Brock Holt filled in, with help from Ian Kinsler after the trade deadline. Pedroia says he'll be ready, but after returning too early last year the team will be careful not to rush him again. ON DECK: The Red Sox open the regular season on the West Coast, starting at Seattle on March 28 and then heading to Oakland and Arizona before returning to Boston to raise their championship flag at Fenway Park on April 9 against the Toronto Blue Jays. J.D. Martinez's consistent bat has moved him into rare air in the Red Sox's record books. Hold off - for now - on the panic in Boston. ST PETERSBURG, Fla. (AP) -- A manufactured run in extra innings capped off a resurgent weekend for the defending World Series champion Boston Red Sox.